Massacre Display Kit is an incredible high-end firework that will make your bonfire night a thing to remember! It comes with 300 shots of pure mayhem and it will prove to be more than suffice to absolutely dominate the skies in the neighbourhood! This is a fireworks that is soft in the middle and hard on the edges, and it brings one of the most spectacular finales you will ever get to see! On top of it all, this is not an expensive piece at all, given the quantity and quality of fun it provides! We aim to deliver your Fireworks within a 7 day window working days however we offer a express service at a additional charge of 14.99 and this will gurentee delivery within 2 working days.in areas like the Scottish Highlands etc this can take working days. FREE DELIVERY ON SPENDS OVER £250 IN ENGLAND,WALES AND MAINLAND SCOTLAND OR £24.99 ORDERS BELOW THIS SPEND. FREE DELIVERY IN SCOTTISH HIGHLANDS ON ORDERS OVER £599.99 OR £39.95 ON ORDERS BELOW THIS SPEND. We cannot deliver to the following postcodes: BT,GY,IM,JE,ZE. Should you live locally you may want to collect from us directly but please note you will need to allow us 2 working days, simply when completing order select this option. Please note that there must be someone above the age of 18 to sign for the fireworks, if you are not there then the courier will leave a calling card to inform you how to rearrange your delivery. Please try and ensure that someone will be there on delivery day as for every attempted delivery made we will be charged and we reserve the right to pass on this charge to you. When the delivery arrives please check this against your delivery note to ensure you have received the correct items. 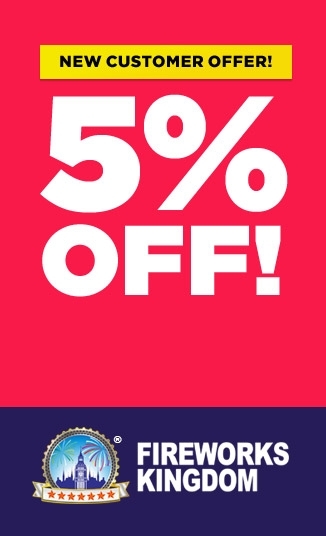 Register and get 5% OFF your first order! It’s quick and easy - just enter your details below.